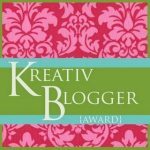 Thank you so much to The Easy-Going Organizer for nominating My Color Coded Life for the Kreativ Blogger Award. 1. I am the youngest of seven children, 5 girls and 2 boys. Because of this I know what I will look like at age 40, 50 and 70. 2. I grew up on a quiet street called Pine Glen Terrace and if I think about it I can still hear the bell my mother used to ring to tell me it was time to come home. When she rang the bell sometimes I was playing with my imaginary friends Jane, Jeff and Paca or my real life friends Debbie and Michael. 4. My childhood nickname was Queen Maureen, partly because of a slight obsession with Princess Diana, partly because of see #3. 5. I was a public school teacher for 9 years and founded an after-school, non-profit, arts education program that I worked at for 5 years. 7. I have 12 nieces and nephews. If you got them all together – they would look like a Benetton ad. I added to this Benetton ad last year. Having my daughter has been the most amazing experience, I only wish my mother was here to see her. 7. The Scrumptious Pumpkin: delectable recipes from healthy ingredients. Thanks so much for the nomination. I’m just starting out, and it’s always nice to be linked and mentioned. You’re welcome. I will need to go back and comment on your site – but my guess is honors in economics? Thanks Maria — yeah – I don’t have too many facts about myself that you wouldn’t know! Check out some of the other blogs I nominated – I think you would enjoy. Especially TaleSpins. Fairy Tales, Vampires (Tuck Everlasting – do you love that or Joe?) – stuff I know you like! There is a “find the difference in the photos” game and I can only find 2! Congrats on the award! And thank you for the nomination 🙂 You have a great blog and I’m looking forward to seeing more from you!